The subcompact two-row crossover 2017 Honda HR-V is available with either all- or front-wheel drive. Honda has made almost 60 cubic feet of space in the interior of the subcompact 2017 HR-V. A front-passenger seat folds flat and extends the cargo floor, plus a “Magic Seat” rear-seat cushion folds up to let taller things to be stowed upright. This is that everyday driver that stands out from the others that you may have been looking for. Let’s go a little further into the 2017 HR-V models and details! The 2017 HR-V gets a 1.8-liter 4-cylinder engine that generates 141 horsepower and 127 lb-ft of torque. 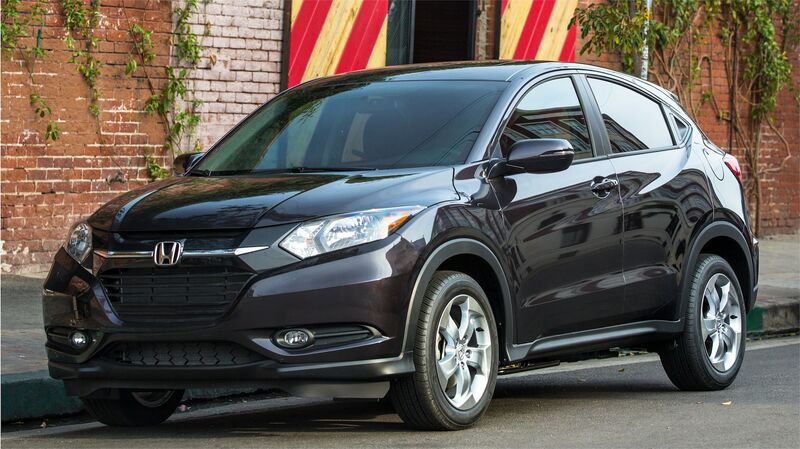 The HR-V can employ either a customized CVT automatic or a 6-speed manual transmission. Front-wheel drive (FWD) is its typical configuration. All-wheel drive (AWD) is available on automatic-transmission models. The all-wheel drive is more for traction on adverse road conditions than heavy off-road glory seeking, but is certainly capable on the commonly traveled byways– potholes and frost-heaves are no problem for this vehicle! Also, there’s an innovative Electric Parking Brake that activates with a single push of a button, then switches back to normal mode when your foot presses the brake. Smart! The Honda HR-V arrives into 2017 in 3 trims: the LX, EX, and EX-L Navi. Standard over all trims are easily folding Magic Seats, 17-inch alloy wheels, a rearview camera, and Bluetooth. Tan leather seats are an option in premium versions, and all versions have an infotainment LCD interface in the center dash. The LX models garner the simple audio and climate systems with welcome physical knobs and push-buttons, or if drivers like, they can go upscale with touch-based systems on the EX and EX-L models. The front-passenger seat can be folded back to form the HR-V’s “Long Mode”. All HR-Vs drive on 17-inch aluminum-alloy wheels, and EX and EX-L models add in a power moonroof. Audio is capably done with a 4-speaker/160-watt AM/FM/CD system, a 5-inch color display screen, and USB/auxiliary inputs. The EX includes Honda’s LaneWatch side-view monitor, push-button start, a power moonroof, heated front seats, and SMS text-message functioning. The HR-V EX also gets a 7-inch touch screen and touch-sensitive climate system paired to an 180-watt/6-speaker sound system. The EX-L Navi model brings the luxury with a leather interior, nevermind the handy navigation system. This premium HR-V also comes with an automatic transmission (optional on other trims), SiriusXM satellite and HD Radio, and paddle shifters with Sport mode. Honda’s ‘Real Time AWD’ system is optional on any trim with an automatic transmission. Some popular accessories across the lineup include front and rear skidplate accents and key attachments to carry recreational items. Is the 2017 HR-V connected well? Yes! You can listen to music, talk shows and audio books with Bluetooth Streaming Audio, Pandora compatibility and available SiriusXM Radio and HD Radio. The 2017 Honda HR-V employs both active and passive safety systems, with several features optional on any HR-V version. Passive safety features bring dual-stage front airbags, side curtain airbags with rollover sensor, Honda’s ACE body structure, and three-point seat belts. Active safety items are made of daytime running lights, a vehicle stability assist with traction control (assists with countering oversteer/understeer), brake assist, Honda’s Lanewatch system, ABS brakes, and a multi-angle rearview camera with guidelines. This is a solid SUV subcompact crossover- take it for a spin with us sometime soon!